Like many owners of the Jeep JK Wrangler, Cindy and I have had an on-going problem with fuel spraying out of the filler port when refueling and have had it for about as long as we’ve owned our Jeep. This problem is not only annoying and frustrating, it’s one that we’ve come to see as being a potential hazard as well. Unfortunately for us, our warranty had ended a long time ago and because of it, have just learned to deal with it the best we can. 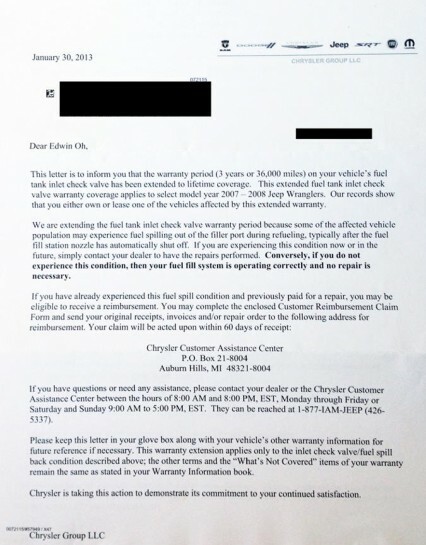 Needless to say, you can imagine how surprised we were to to get a letter in the mail yesterday from Chrysler indicating that the warranty period on our Jeep’s fuel tank inlet check valve had been “extended to lifetime coverage”. Apparently, someone finally got the message and as the letter explained, Chrysler was taking this action “to demonstrate its commitment to our continued satisfaction” – way to go Chrysler! Excited by the news, I decided to contact Bob Baker Jeep in Carlsbad, California this morning to make arrangements to have this problem addressed. Having worked with them in the past and with good results, it looked as if this was going to be a no brainer or at least, up until my service advisor informed me that he wasn’t going to be able to help me after all. As it turns out, he got a message on Chrysler Dealer Connect that instructed him to “NOT DO ANY warranty repairs” on my Jeep. When I asked why that was, he said that he honestly didn’t know and recommended that I contact Chrysler directly to find out. Well, this afternoon, I did just that. I called 1-877-I-AM-JEEP and eventually spoke with a Chrysler rep named Debbie. After verifying my account and explaining the situation, she put me on hold to look into my case. About 5 minutes later, she came back on and informed me that they would not honor the extended warranty in question because my Jeep was “modified”. Never mind that we’ve had this problem before it was modified or that countless other owners of the JK are having the very same problem and to the point where they’re the ones contacting us to have something done about it. She went on to suggest that my dealership is the one who’s preventing this extended warranty from being performed and to that, I let her know that they’re the one who told me to call Chrysler as they were the ones standing in my way. After politely going back and forth on this, I convinced her to call my service advisor to clear this up. I gave her his information and she put me back on hold for about 10 minutes. When she came back, she insisted that she talked to him and that they didn’t want to do the work. At this point and time, I politely asked for the name of her supervisor, found out that it was Bill and, asked to speak with him. To this, she explained that he was busy and that he would have to call me back tonight or tomorrow. After hanging up the phone, I immediately contacted my service advisor at Bob Baker Jeep and asked him why he would tell Debbie that he didn’t want to work on my Jeep. Upon hearing this, he became a bit angry and explained to me that they were lying. He said that their computer states my Jeep was restricted for ALL warranty repairs. He insisted that he NEVER got a call from Chrysler or Debbie and suggested that I contact them again and have them do a 3 way call to prove the call is actually being made. He further went on to say that he’s absolutely ready to perform the warranty but needs to have them him the OK first. I have yet to get a call back from Chrysler. So, here we are once again, at the mercy of Chrysler and wondering if it’s even worth it. I have to almost wonder if Chrysler purposefully sends out token letters like these filled with fancy words like “commitment” and “satisfaction” and in an effort to make themselves look good while in reality, doing a whole lot of nothing for anyone. And, if they really have no intensions of actually helping their customers with a significant safety issue like this, they shouldn’t even give them the hope of it. I have to say, as much as I love the products Chrysler makes, they sure do have a way of letting their customers down. Does Chrysler really not realize how poorly this kind of obscene warranty run around makes them look in the eyes of current and potential owners? I know it’s not Chrysler owning up to & fixing the problem, but at least your shoes won’t smell like gasoline. These kind of contradictory actions make me not want to buy another Jeep! What does the poor venting of the factory installed fuel system have to with modifications done to suspension and the body. Luckily my Jeep doesn’t suffer from this flaw. ITS REALLY DISAPPOINTING TO SEE THIS, THE JEE WRANGLER HAS BEEN A SUCCES SINCE THEY CAME UP WITH THE 4 DOOR JEEP, BUT BIG PART OF THE SUCCES OF THIS CAR IS ALL THE WORK THAT PEOPLE AS PROJECT-JK HAS BEEN DOING OVER THE LAST YEARS, THATS THE BIGEST PROMOTION THAT THEY HAVE AND ITS FOR FREE. HERE IN MEXICO MANY PEOPLE GOES TO THE JEEP AGENCY AND ASK IF THEY SELL THE JEEPS WITH BIG TIRES AND ALL THE STUFF THAT WE PUT TO OUR JEEPS, AND THATS BECAUSE THEY LIKE SO SEE THEM ON THE STREET. Seriously I’m about 8 months (hopefully less) from buying a new JKU but if Chrysler is going to fabricate reasons to not honor my warranty what incentive is there for me to buy a new one when I can save some bucks and buy used?